Christian Rebollo loves Christmas. The Las Vegas resident displays six full-size trees at his home each year. “‘Why so many?’ is the most common question I hear when people come see the display of trees,” he explains. “The joyful kid and Christmas-lover inside me says, ‘Cause I love decorating for Christmas." Rebollo says that “a fresh-cut tree’s beauty stands untouchable,” and he appreciates the colors and textures, as well as the smell. “No candle, no hanging pine scent ornament and no air freshener can truly captivate that scent that awakens that feeling of Christmas,” he says. In 2010, 27 million trees were sold, a retail value of about $976 million, according to the National Christmas Tree Association, a national trade association representing the Christmas tree industry. Trees are also good for jobs, resulting in the full- or part-time employment of 100,000 people each year. There are about 15,000 tree farms in the United States, situated on a million acres of farmland. 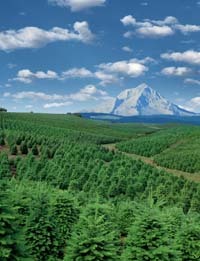 Mike Bondi, a professor of forestry at Oregon State University’s Extension Service who works with the Pacific Northwest Christmas Tree Association, which represents more than 1,000 farms throughout Oregon and Washington, estimates that of the 25 million to 30 million trees that will be sold nationally this year, “almost a quarter will come from Oregon alone,” followed by Washington State. According to NCTA, other top tree-producing states include North Carolina, Michigan, Pennsylvania and Wisconsin. It used to be that Christmas trees were cut from the forest. But nowadays, they’re grown on tree farms, a practice that started in the 1950s. Generally, each tree is grown five feet apart from other trees. “It all starts with a seed,” explains Bondi, noting that many trees are grown just for seed production for characteristics such as shorter needles, upright growth and ideal coloring. The seeds are germinated in a nursery for two years. Then farmers purchase and plant the seedlings, which are about 8 inches to 18 inches tall at the two-year mark. “Once planted, they become like any other crop grown by farmers,” says Rick Dungey, public relations manager of NCTA. When a tree is about 3 years old, farmers start “preparing it and shaping it” to look like the Christmas trees consumers want to buy, says Bondi. Still, trees mature at different rates. “It typically takes about six to eight years for a tree farm to get a seedling grown and shaped to the most common size of six to seven foot for harvest and sale,” says Dungey. Each type of tree has a specific growth timeframe. In 2010, 27 million trees were sold, a retail value of about $976 million. There’s a very short window to sell Christmas trees. Bondi says the season runs from mid-November to Dec. 24. The harvest happens even earlier, usually between Nov. 10 and Nov. 22, right before Thanksgiving. Still, some trees are harvested and shipped much sooner. Christmas trees going overseas to destinations including Korea and Japan are cut in late October and shipped in refrigerated containers, where they’ll travel for three to four weeks. Shipping to U.S. destinations is much faster -- typically within five days. Usually, brokers or farmers market and sell the trees to retailers, including nurseries, independent tree stands and big-box stores. Christmas trees don’t just look green; they are “green.” And the industry prides itself on the crop’s sustainability. “We plant more trees every year than we harvest,” says Bondi. Christmas trees can grow in poor soil conditions, and they don’t require much watering or weeding. After the holiday, they can be recycled, often through composting or mulching. “Even if it’s something we only use a small part of the year, there’s a lot of fun, enjoyment and positive feelings,” says Bondi of Christmas trees. Rebollo agrees. As a Christmas enthusiast and with a career as a designer, he loves the experience. “In my field of work, I get to decorate dozens of Christmas trees every year,” Rebollo says, noting his tree designs have been displayed in residential lobbies, businesses and homes.